So hypothetically speaking... if I were to bust out my ancient 4-CD set of PS:T discs & install it onto my Win7 machine... what would be my best approach for actually making it more than the handful of hours that I've managed in prior attempts? I think the furthest I've ever gotten is to the first bar... possibly into the next area just after that. Despite playing through the Mortuary at least a half-dozen times. I'm going to go out on a limb and say that if you feel you're losing momentum, check a walkthrough for where to go next. And set the difficulty to easy, if such a setting exists. The point of the game is really to experience the story anyway, so high difficulty will just be another obstacle to completion. Finally, make sure you put a bunch of points into one or more of wisdom, intelligence, and charisma, since these affect what dialog options are available when you talk to people. The main character is kind of multiclass by nature, so points will be useful for some skill regardless of where you put them. I think the game is best played with a high wisdom/intelligence/charisma. Wisdom is the most important stat. Having high wisdom will open new dialogue options, some of which reward you with XP by unlocking hidden memories. It also gives you a bonus to any XP you gain. Constitution will also help due to the regeneration it gives you and that any bonus hit points are applied retroactively. You start as a fighter, but any of these NPCs can change your class (you can never be a priest). You can only be one class at a time, and each class tracks its level separately, so you go from a level 5 fighter to a level 1 mage or thief the first time you switch. You get one-time-only specialization perks for whichever class you reach level 7 and 12 in first, so keep that in mind when leveling up. Talk to everyone. Try to figure out what alignment you want to be early on though, as your dialogue choices does affect this. Talk to your party members a lot as well. You can improve their stats by learning their backstory, but the option to do so is usually based on specific attributes. I made Dak'kon quite powerful early on by talking to him about the Circle of Zerthimon. There are some places where you can't talk you way out of combat, but keep in mind that unlike Baldur's Gate, you do not have to gather your party before venturing forth. You can keep most of your party in a safe area and just have one character (usually The Nameless One due to his regeneration) rush to the next map and the entire party will transport with them. In Torment, I'd say Intelligence/Wisdom/Charisma/Constitution are the most important, in that order, for any character class. IIRC, what I did last was to be a fighter for the first nine levels to get the hit points, and then switched to mage. You're over 20th level by the end of the game, and this is a strong combination, though the spells in Torment don't let it be as overwhelming as it is in Baldur's Gate. I believe your character doesn't suffer any of the usual penalties for multiclassing though, so there's absolutely no reason to stick with a single class. Thanks all! I'll give it another shot. Merphle - also check out this for some mod support, esp. the Widescreen mod and the WS mod UI fix. The others on that page are good to have as well. Playing an Infinity Engine game these days pretty much requires adding the Widescreen mod, IMHO, even if you don't want to go for the fixes, tweaks, etc. mods. Thanks tboon. I followed the original guide, which had one critical required difference due to my ancient 4CD set install (not GOG). I'm all installed, patched, wide-screened, restored, and READY TO GO. Such a good game. Be sure to call yourself Adahn whenever you get the chance. I was wondering if anyone else is wondering what this new Torment game is going to be? I was thinking of donating, but there's a few things that make me feel uncomfortable with pitching in. First off, they're already working on wasteland. Second, they use vague descriptions that the game will be similar Planescape but not a continuation of the world or player sense. Watch the video. They have answers for both of those questions, in detail. Oh yeah, CDs. I remember those. "I'm sorry for expecting you to Role-play disadvantages in a game that's about Roleplaying. I mean, it's right there in the title. " That video with automatic English captions is even funnier. Valves are awesome indeed, father please okay. "...such video game errors as plane state for rent"
Late to the thread, but I Kickstarted this game within days of its launch (never mind that it was already funded). I'd pretty much heard "Torment", and my ears perked up (I loved PS:T) and then saw Mark Morgan was making the soundtrack and I was sold. Then I went on (relative) blackout. I didn't read the updates, I didn't look up the plot. And I came here and read Stengah's updated OP, and I'm really excited. I just love that they're committing to asking a delicate question through a game, telling a deep, rich story. The Planescape setting wasn't all that important to me, and I know nothing of the Numenera setting, but I just love what they're trying to do here. So yeah, posting to tag this thread, and be part of the conversation, this is one game I could really get excited about (but I'm trying not to right away, because I hate waiting when I'm all excited about a game ). Oh, and as for the Nameless One's fate, I was under the impression that the Blood War would be never ending and that he'd be stuck fighting it forever. That, or the Burger King in Jersey. Yeah, I always joke that a real sequel to P:T would have to be an online persistent hack'n'slash game. Anyone else feeling the itch to give P:T another spin? I started a new game yesterday. Just checking, if I'm not alone than maybe we can create a P:T discussion thread or something. 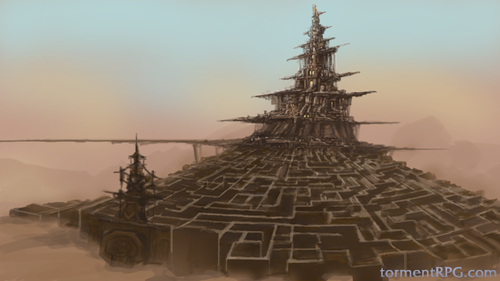 Also, there already is a Planescape: Torment thread, let me just find it for you (I stumbled upon it earlier today). Edit: Planescape: Torment (on GOG) thread over here. Heh, not a bad idea, but honestly, I feel that Torment: Tides of Numenera's record-breaking speed in reaching their goal was a bit artificial in nature. They were talking about it as early as mi-January, and the anticipation only built up from there. No surprise that everyone rushed when the Kickstarter finally launched on March 6th. Of course, that's just my opinion, and is based solely on personal observations, no scientific data here! And also: time-zones. Time-zones to the max. There was no way I was gonna get up in the middle of the night to do something that I could do the next morning when I got up. Not my fault they reached 900K in 6 hours. Well, looking at the Kicktraq chart, you can see the trajectory started off high and leveled off in a couple of days, indicating that they did leverage much of their pre-existing market base, energizing them before the project started. As a side note: that's how you do Kickstarter marketing, people. Watch and learn. I was in at hour three as well, and it was already 200 thousand with the 20 dollar tier almost sold out. This has to be the fastest Kickstarter I have ever seen. Also, it was really well prepared and I guess this further fuelled confidence in the developers. SQUEEEEE!!! Thank you for posting these. I'd seen them on the game's official website, but they're just so freakin' gorgeous, I love them. The concept art is extremely vivid, it's simply amazing. In my humble opinion, good, solid concept art bodes well for the game, but wait and see, I guess. Shouldn't you be playing Anachronox now? Clearly you're not because you're posting.